Decoding Kerala floods: The last time Kerala received excess rainfall between June-September months of the southwest monsoon was in 2013. Between June 1 and August 18 this year, the state of Kerala received cumulative rainfall of 2344.84 mm against a normal course of 1649.3 mm. That’s an excess of 42.17% of rainfall received over the course of two-and-a-half months of the southwest monsoon, data from the India Meteorological Department (IMD) in Thiruvananthapuram show. Ten districts of the state including the likes of Ernakulam, Alappuzha, Kottayam, Kollam, Kozhikode and Malappuram, extending all the way from erstwhile-Travancore to the Malabar region. One district, in particular, Idukki, has received a ‘large excess’ of rainfall this year, over 70% than the usual quantity it gets every monsoon. Idukki, a hilly district home to several major dams like the Mullaperiyar and the Cheruthoni, has been completely cut-off this week with major arterial roads connecting it to the rest of the state ravaged by landslides. Surging waters released from the dams have also caused major damage to towns like Cheruthoni, situated close to the Idukki reservoir. It is pertinent to note that no district of Kerala has received deficient rainfall this year. Last year, in 12 months, Kerala received 2664.9 mm, marginally more than what it got in two-and-a-half months (2344.84 mm) this year. In four months of the southwest monsoon between June 1 and September 30 last year, Kerala received 1855.9 mm against a normal course of 2039.7, pointing to a deficiency of 9%. According to IMD officials, any amount of rainfall in the range of +/-19% is considered a ‘normal’ monsoon. This year, the national capital of Delhi has received 346.7 mm against a normal course of 440.6 mm, pointing to a deficiency of 21%. The state rainfall map of the IMD (below) shows how Kerala is the only state in the country recording excess rainfall this year. 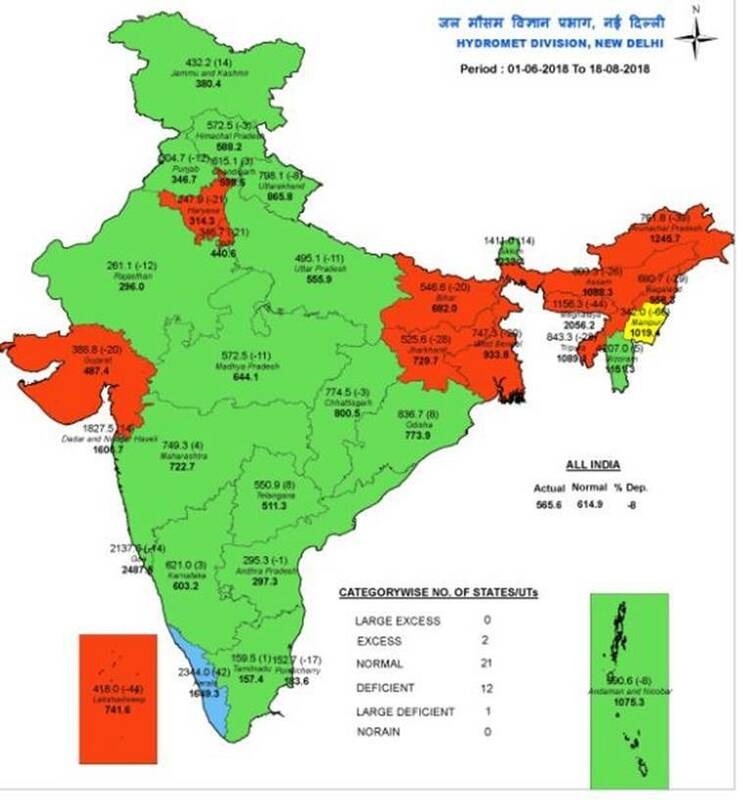 While 21 states have recorded a normal monsoon, 12 others have received deficient rains. The last time Kerala received excess rainfall between June-September months of the southwest monsoon was in 2013 when it recorded 2561.2 mm (excess of 26%). This year, the state is on the path to beat those figures.